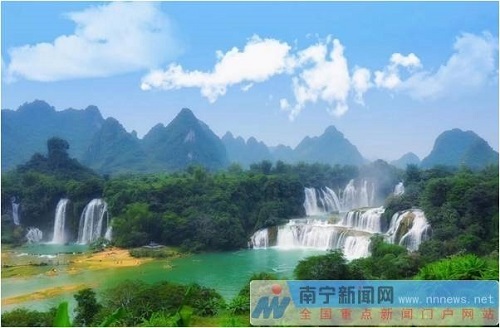 Recently, at the awarding ceremony for the new 5A scenic spot held by the Ministry of Culture and Tourism, Detian Transnational Waterfall Scenic Spot in Daxin County of Chongzuo City was officially identified as the national AAAAA scenic spot. For this reason, Detian Scenic Spot is open for free (excluding sightseeing vehicles) to visitors this weekend on November 3-4. Detian Transnational Waterfall, located in the southwestern border area of the motherland - Daxin County, Chongzuo City, Guangxi Zhuang Autonomous Region, is facing Vietnam and next to ASEAN countries. The surging and magnificent waterfall spanning China and Vietnam with a width of more than 200 meters, a depth of more than 60 meters and a height of water of 70 meters is the largest cross-country waterfall in Asia and the most beautiful one in China. The scenic spot is home to a number of unique natural and human landscapes with cross-national resource endowments such as Ten-li Long Guichun Boundary River, Waterway International Market and No. 53 Boundary Monument.